Did you know that there are more than 24 different kind of mangoes growing in Saint Lucia? And even better, they all will be ripe to eat in June which is why we declared June the month of Mango. 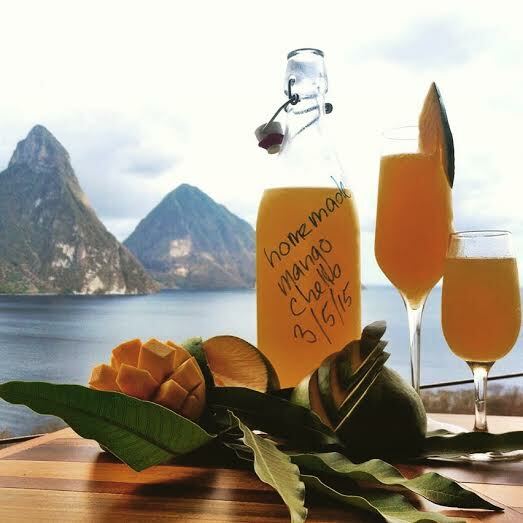 Guests staying at Anse Chastanet and Jade Mountain Resorts will delight in the many mango based culinary activities and services offered during the month of June. Guests may partake in weekly mango tasting classes showcasing the varieties of mango available on the island of St Lucia. Together with the resorts’ mixologists, learn how to make the perfect Mango Martini, Mango Mojito and Mango Daiquiri, to name just a few. Together with the Chef de Cuisine, participate in the interactive classes to make mango chutney and mango jam and take the results of your cooking experience home with you. 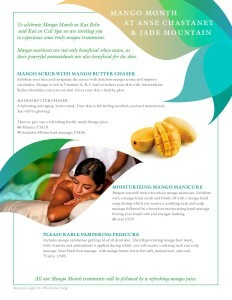 And in the resorts’ spas, you will be able to experience mango body scrubs, wraps and massages. In the boutiques, find an exotic array of candles, soaps and other mango delights and souvenirs celebrating the month of Mango. 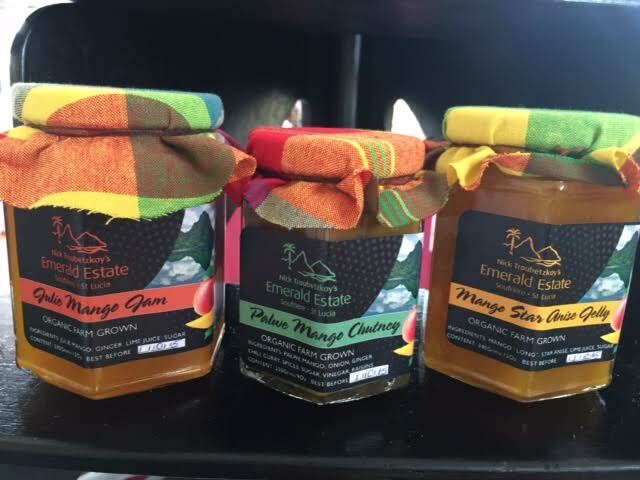 Last but not least, visit the organic Farm Emerald’s to see the mango trees and the great variety of other organic produce grown there. Did you know that consulting chef Allen Susser is the National Mango Board spokesman and is the author of the The Great Mango Book? In the restaurant you will have the option to sign up for a spectacular 6 course mango gourmet dinner and of course many of the dishes served during the month of June will have mango ingredients. 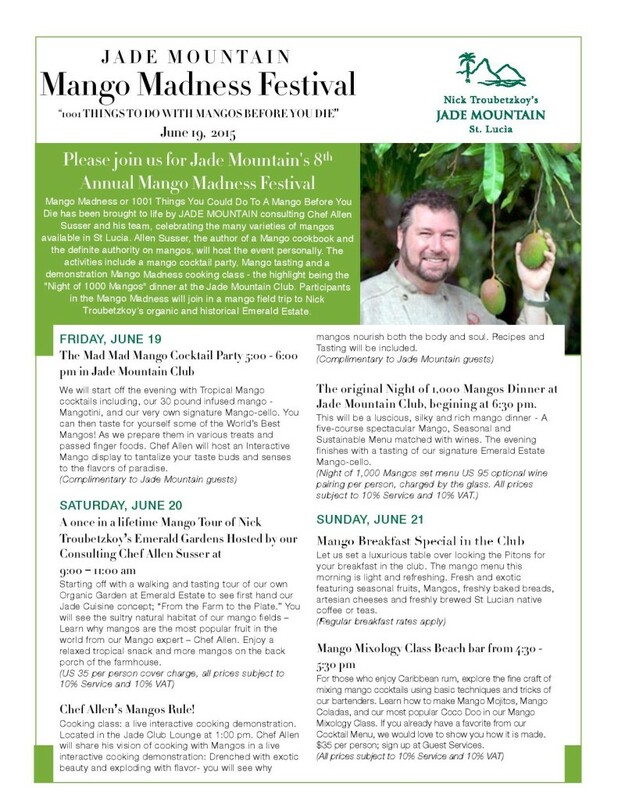 The month of mango culminates in the Mango Madness Festival which takes place from 19 – 23 June 2015, where you can meet Chef Allen Susser and the entire culinary team personally during a string of events. 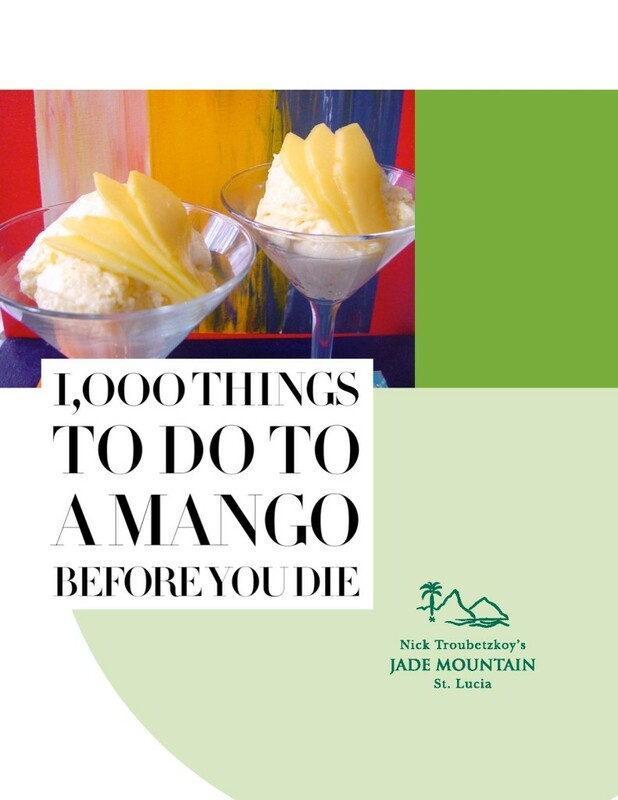 Mango Madness or 1001 Things You Could Do With A Mango Before You Die has been brought to life by JADE MOUNTAIN consulting Chef Allen Susser and his team, celebrating the many varieties of mangoes available in St Lucia. Allen Susser who is the author of a Mango cookbook and the definite authority on mangoes, will host the event personally. 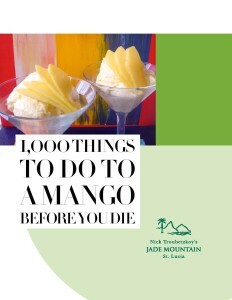 The activities include a mango chutney work shop, mango cocktail party, Mango tasting and demonstration Mango Madness cooking class – the highlight being the “Night of 1000 Mangoes” dinner at the Jade Mountain Club. Participants in the Mango Madness will join in mango field trips to the resort owned organic and historical plantations of Anse Mamin and Emerald. The farewell event will include a Mango Champagne Brunch served on the beach at Anse Mamin estate. “Jade Cuisine is a celebration of the bold flavors of the world’s tropical cultures in my kitchen at Jade Mountain”, says Chef Allen. “The cooking is fresh, simple and succinct. There is always flexibility for the seasons, and availability of local products. As a chef my passion is taste. The bottom line here is that food comes to nature and the nature of taste.” Allen Susser personal culinary viewpoint has been established since 1986 upon opening his groundbreaking Miami restaurant Chef Allen’s. The New York Times called Allen the “Ponce De Leon of New Florida cooking”. Chef Allen’s new New World Cuisine is fresh and flavorful, like a tropical vacation on a plate. His vision of what the future holds is a culinary fusion of cultures that share similar landscapes, tropical ingredients and diverse spice boxes. 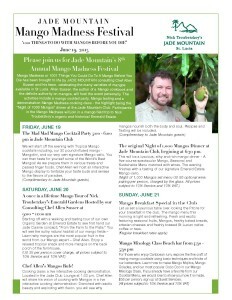 Allen is currently the spokesman for the National Mango Board, and serves as President of the Miami, Florida Restaurant and Lodging Association. He is a prestigious James Beard Award winner and received an honorary Doctorate of Culinary Arts from Johnson and Wales University. Allen was Chef of the Year for Share Our Strength for his community involvement to End Childhood Hunger, as well as currently active on the Board of the Daily Bread Food Bank. His published works include New World Cuisine and Cookery, The Great Citrus Book and The Great Mango Book. The Mad Mad Mango Cocktail Party 6:00 pm – 7:00 pm in Jade Mountain ClubWe will start off the evening with Tropical Mango cocktails including, a 30 pound infused mango – Mangotini, and the St Lucian Rum Mango Mojito. You can then taste for yourself some of the World’s Best Mangoes! As we prepare them in various treats and passed finger foods. Chef Allen and the Executive Chef will host an Interactive Mango display to tantalize your taste buds and senses to the flavors of paradise. Starting off with a walking and tasting tour of the Organic Garden at Emerald Estate to see first hand the Jade Cuisine concept; “From the Farm to the Plate.” You will see the sultry natural habitat of the mango fields – Learn why mangoes are the most popular fruit in the world from a Mango expert – Chef Allen. Enjoy a relaxed tropical snack and more mangoes on the back porch of the farmhouse. Cooking class: a live interactive cooking demonstration. Located in the Jade Club Lounge at 1:00 pm. Chef Allen will share his vision of cooking with Mangoes in a live interactive cooking demonstration: Drenched with exotic beauty and exploding with flavor- you will see why mangoes nourish both the body and soul. Recipes and Tasting will be included. Sunday should be a day of rest and tranquility. 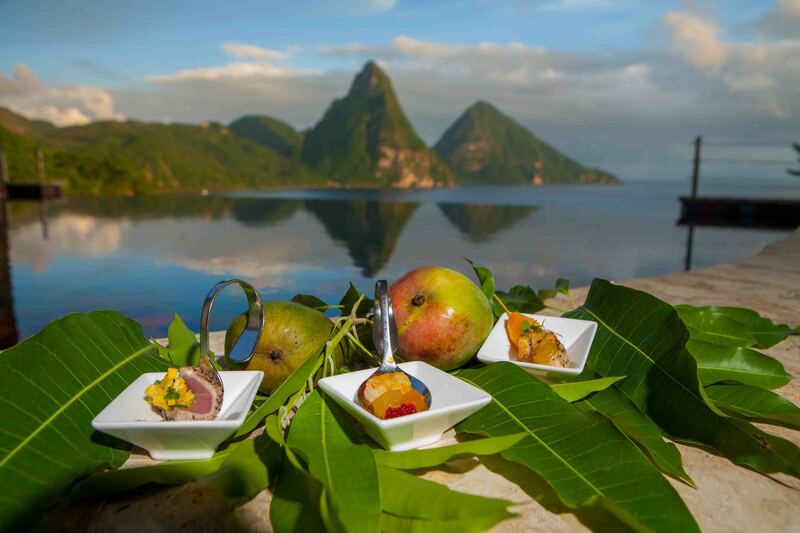 Let us set a luxurious table over looking the Pitons for your breakfast in the club. The menu for Sunday – in Paradise – morning is light and refreshing, fresh and exotic featuring seasonal exotic fruits, Mangoes, freshly baked breads, artisan cheeses and freshly brewed St Lucian native coffee or teas. For those who enjoy Caribbean rum, explore the fine craft of mixing mango cocktails using basic techniques and tricks of the bartenders. Learn how to make Mango Mojitos, Mango Coladas, and the most popular Coco Doo in the resort’s Mango Mixology Class. If you already have a favorite from the resort’s Cocktail Menu, we would love to show you how it is made. $35 per person; sign up at Guest Services. Take a resort shuttle boat over and enjoy a leisurely lunch grilled under the palm trees and mango trees. The menu is simple and delicious featuring freshly caught fish, Mangoes, and salads. Tour the Plantation at Anse Mamin With Special Guide Meno at 1:45 pm. The grounds include an old and tropical plantation called Anse Mamin. The plantation was originally a sugarcane plantation in the 18th century, until changing hands turned towards Cocoa plants. The cocoa plants are still numerous on the grounds for guests to see and for Jade Mountain to produce its own estate chocolates. 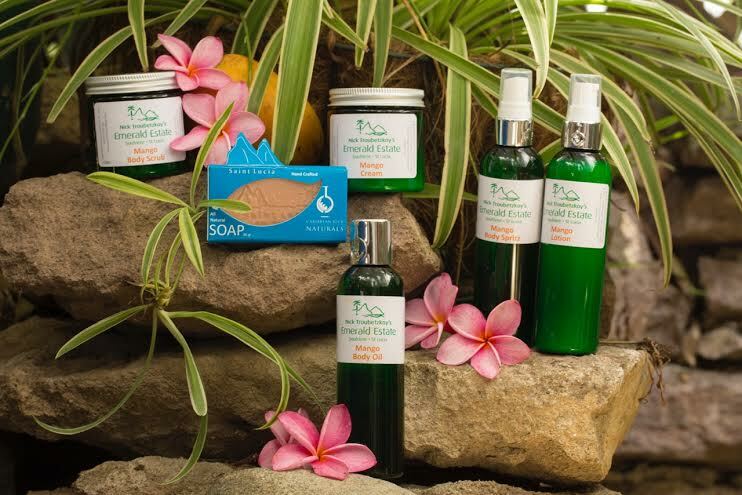 In Anse Mamin one can find turmeric, cashews, tamarind, mango, avocado, oranges, tangerines, guavas, papaya, coconut, breadfruit, yams and sweet potatoes. See the mango trees throughout the Plantation. The superior taste and quality of the ingredients as well as the connection to the earth is the culinary motivation. By happenstance Anse Mamin is a wonderful organic resource. 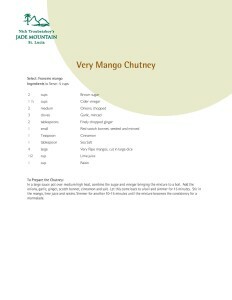 Learn how we preserve the exotic flavor of mango with spices in the age old tradition of chutney making. Enter the mango, preferably a fresh picked one—any variety will do. And imagine your paradise. There is no clever chemistry in detecting ripeness. It’s about a feel (gently) and a smell (go to town). Color has less bearing here than in the real world, and that is as it should be. The mango-pantone is rich, filled with green, red, purplish-red, yellow, spotted, or any combination of the above, and comes in all shapes and sizes. This will be hands on with sample jars for you to take home. Come join us on the celestial terrace for exotic, tropical and Mango cocktails and passed Hors D’Oeurves that reflect the wonderful flavors of 1001 mangoes. 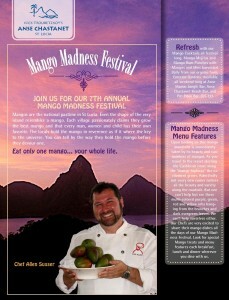 Learn more about the Mango Madness from the flyers below.